The Wheels Verdict: The new Mazda 3 has leaped two generations ahead, with class-leading refinement and a considerable improvement to ride and handling. The carry-over engines don’t match the obsessive efforts elsewhere, but the highly-anticipated Skyactiv-X engine isn’t far away. WHAT IS THE MAZDA 3? A darling hatchback that has filled many first-time car buyers’ driveways, the small Hiroshima car has long been seen as a staple choice for value and reliability. Now in its fourth generation, Mazda has stepped up the 3’s game, seeking to deliver a car that will transform perceptions of both the model and the brand. Likely to be the sales leader in the new 2019 Mazda 3 line-up, the Evolve G20 is a value-packed blend of creature comforts, big car quality and aspirational styling. You can forget just about everything you thought you knew about the Mazda 3 because this all-new model elevates itself in nearly every measure. It’s an incredible feat considering the brand’s five-year-old small car recently toppled the fleet-favourite Toyota Corolla as the best-selling passenger car in Australia, which might lead one to think that this latest evolution will tip the scales even further in its favour - but not everything is peachy. 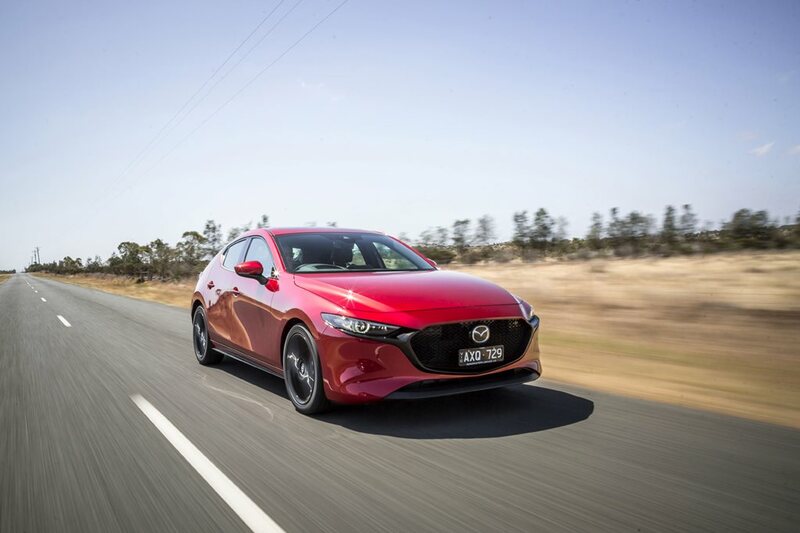 Mazda Australia could be in for a bit of an adjustment - despite this being a game-changer - with the aggressively priced prior generation Mazda 3 enjoying huge reach to private buyers. However, the cost of entry has just gone up, from the old Neo Sport’s competitive $20,490 to the new entry-level G20 Pure’s $24,990 plus on-road costs. But it’s a better car with a lot more kit. And don’t forget the new Toyota Corolla has seen a steep adjustment in price too. Filling the equipment list from the base model up is a comprehensive ‘i-Activsense’ safety kit featuring AEB, adaptive cruise control with stop and go function, lane-keeping assist, lane departure warning, speed sign recognition, forward obstruction warning, rear-cross traffic brake assist and reversing camera. Some premium-brand models would be envious of that list. There’s also a 8.8-inch widescreen infotainment screen inside with sat-nav as standard, a 7.0-inch driver’s display in the dash, head up display on the windscreen, rain-sensing wipers, and high beam control. About the only lowbrow addition, in contrast to every other model’s sporty look, is a set of small 16-inch alloys - so it's just as well we were in the step-up Evolve. It comes with larger 18-inch alloys with a grey metallic finish that are much more appealing, along with a few extra mod cons such as dual-zone climate control, leather-wrapped steering wheel and gearshift, paddle shifters mounted on the steering wheel and a rear centre fold-out armrest. Visually, the exterior of this Evolve is virtually identical to the striking stance of the almost $40,000 G25 Astina range-topper. Step inside and there’s also a similar resemblance between all models, Mazda’s designers penning an interior that leaps ahead of simpler rivals into the realm of premium. The soft roll-top gently undulates across the upper portion of the dash where a crisp infotainment system sits neatly tilted toward the driver. Using a high-definition display that features both Apple CarPlay and Android Auto, the infotainment system is a world apart from any Mazda currently sitting on the showroom floor. What puts it in front of competitors is the control system that does away with clumsy touch-screen input to keep driver distraction – moving eyes away from the road - to a minimum (and is also why the crystal-clear head-up display comes standard on every model). Instead of fussing with fingers on the screen, a finely tuned rotary dial teams up with a smaller knob and sensible shortcut buttons that make navigating from CarPlay to vehicle settings effortless. The touch points are all finely finished with a quality feel and tactile response too, and the steering wheel, with its perfectly round rim and logical placement of controls on the spokes is a high-end fitment. Upper-grade models, with their nicer leather-appointed seats and suite of mod cons, raise the bar in the segment, but this Evolve variant’s cloth seat trim looks rather plain and feels a touch scratchy. The seats’ internal construction, however, is the same across the range and an important factor which leads to fantastic ergonomic support and comfort on a long drive. The driver is further catered to by extensive tilt-and-reach adjustment from the steering wheel and a wide-ranging seat position. The rear seat is not so spectacular in terms of comfort or entry. While the seats themselves are well cushioned and have enough lateral support, leg room doesn’t seem to have improved despite the wheelbase growing 25mm to 2725mm, and headspace is tight due to that voluptuous styling wrapped around the rear haunches, further squishing the rear-door aperture. Form over function has a further impact on boot space, which disappointingly shrinks from its previous 308-litres (SAE) to 295L. That's still 78L larger than the Corolla, despite also fitting a space-saver spare tyre underneath a false floor. However, minor shortcomings will likely be overlooked once you push the ignition. Mazda has made a big noise about a lack thereof, making a giant leap forward in reducing noise, vibration and harshness (NVH) that tarnished previous models. It claims NVH is class-leading, that sound intrusion has been clubbed to death, and ride and handling has improved by leaps and bounds - all despite the perceived regression from multi-link to a torsion beam rear suspension set-up and just a 20kg heavier kerb weight that doesn’t seem to explain the heavy sound-deadening and stiffness required for its enhancements. It’s the result, says Mazda, of research into jinba ittai. The basis of Mazda's explanation reads like Gray's Anatomy, but the crux of it is about making the vehicle and person feel as one. The upshot of all this is that the new fourth-generation Mazda 3 should feel lighter on its feet and transmit fewer imperfections and jolts from the road because of innovative vehicle construction techniques. The explanation behind the quieter cabin is simpler: the usual holes and cavities for things such as speakers and wires to go in have been left uncut, reducing the number of passages through which sound waves can travel. Sitting at 100km/h on a choppy road is much more hushed; on a smooth surface, it’s as quiet as a luxury sedan. Major improvements are not limited to NVH, with steering that feels oily smooth and body control that is tight and tidy around even the bumpiest of corners. Mazda 3’s program manager, Kota Beppu, justified to us that the move from a sophisticated multi-link rear suspension to a torsion beam set-up was to decrease rear-wheel toe-in when cornering, which in turn reduces understeer. Whatever the reason, the result is much-improved ride and handling. As ‘all-new’ as Mazda says the BP Series 3 is, the driveline is, for now, a carry-over, save for some revisions to the six-speed manual and automatic transmissions. The same 2.0- and 2.5-litre naturally-aspirated Skyactiv-G petrol engines power the line-up and are now referred to as G20 and G25 respectively. We don’t yet get the compression ignition 2.0-litre Skyactiv-X mill which promises increased efficiency with improved performance when it lands later this year and is likely the missing cherry on top of an otherwise fastidiously well-planned package. Producing identical output figures of 114kW at 6000rpm and 200Nm at 4000rpm, the G20 is lethargic and underpowered inside the 1325kg hatch. It takes a long prod on the throttle to liven up, and even then it feels short of breath on hills and overtaking. It is pleasant for urban duties and plodding through traffic, but it never really provides a showcase for the finer points of the 3’s nuanced ride and handling characteristics. The G25 powerplant, which mirrors its previous 139kW/252Nm figures, is a solid step up in performance for a $2800 premium on the Evolve, and it adds needed punch and certainty. But against turbo rivals it lacks energetic enthusiasm off the line. It leaves us wondering if it would have been better to launch fully armed with the Skyactiv-X, but like the model before it, the lesser engines will still find many loving homes.